PHILADELPHIA, PA – April 20, 2017– Singer, songwriter, and producer, VASSY, has recently been awarded the Best Electronic Vocalist at the World Dance Radio Awards (WDM). The World Dance Radio Awards took place on Wednesday, March 5, 2017 at the sold out Estadio Azteca in Mexico city where VASSY appeared alongside some of the biggest names in dance music; David Guetta, Martin Garrix, Steve Aoki, Nervo, Alan Walker and Cedric Gervais, in front of 100,000 exhilarated Mexican fans. It was no surprise to see VASSY’s infectious energy fuel the crowd, upholding the talented songstress’s reputation as the queen of EDM. 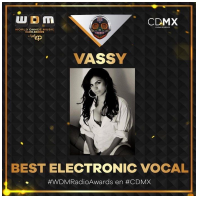 Fans from all over the world voted for VASSY making her the first ever vocalist to win a WDM award as well as the only female solo artist to win at this year’s awards ceremony. VASSY’s career rose into the spotlight in 2014 with her Multi-Platinum and 12 X worldwide Platinum collaboration “BAD,” with David Guetta and Showtek, which garnered her an IDMA award for Best Vocal Performance in 2015. VASSY proved to be a true triple threat when the following years she released her collaboration with Tiësto and Kshmr on the No. 1 electro-house Multi-Platinum single, “Secrets,” which met massive successes, adding more awards and platinum certifications under her belt. Since then, VASSY has been taking over festival arenas with Tiësto during his 2016 Ultra, Electric Zoo and Tomorrowland sets, proving she’s unstoppable. Her latest high-energy dance-floor solo record “Nothing To Lose,” co-produced by Tiësto, hit No. 1 on the Billboard Dance Club Charts and on U.S. Dance Radio, as well as vaulted into the Top 10 of the Billboard Dance/Mix Show charts within the first three months of its release.